Originating during the 1960s, the Lancashire Heeler was developed as a herder and driver of cattle and sheep. They are the smallest of the English herding dogs and were also adept at hunting and catching both rabbits and rats. Today this breed continues to be used as a working dog and companion. 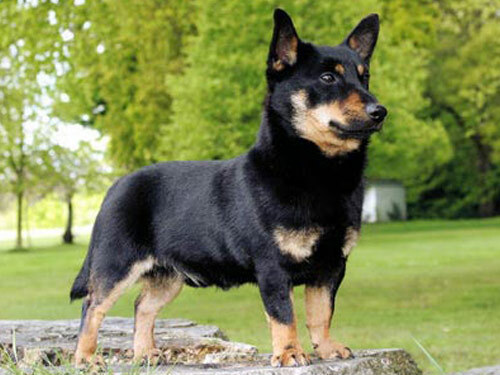 Lancashire Heeler's are relatively rare in North America. The Lancashire Heeler breed is sturdy, strong, hardy, and well-built. They are agile, athletic, and quick-witted. this breed is energetic, hard-working, and alert. This Lancashire Heeler breed is extremely affectionate and loyal. The Lancashire Heeler does best in a home with older considerate children. They do well with dogs and other household pets. Lancashire Heeler's are wary and suspicious of strangers and will alert their family to visitors and danger. Lancashire Heeler's require weekly brushing with a wire brush. Bathing should be done when necessary. This breed is prone to such health issues as Collie Eye Anomaly, Patella Luxation, and Primary Lens Luxation. The Lancashire Heeler is a double coat breed. The outer coat is weather-resistant, thick, short, hard, and flat. The hair around the neck is slightly longer. The under coat is fine in texture. This breed sheds seasonally in Spring and Fall. With the Lancashire Heeler breed, early socialization and obedience training is recommended. As a herding breed, they must be taught not to nip and herd people. The Lancashire Heeler requires a dominant handler as they have a tendency to be stubborn and difficult. They will not respond to harsh or heavy-handed methods. Training must be done with firmness, fairness, and consistency. The Lancashire Heeler breed will do okay in an apartment provided they are sufficiently exercised and given proper mental stimulation. They thrive on and enjoy securely leashed walks, free-play in a securely fenced yard, herding, and family activities.